Since our team are sorted into 4 groups our target is constructing the Sensor cell in our system. According to our design, we need to construct two gene pathways. Consequently, we use the following parts: pLac (BBa_R0080), Promoter C and arabinose C operon (BBa_I13458), RBS (BBa_B0030), LuxI (BBa_C0061), double terminator (BBa_B0015), Constitutive promoter (BBa_J23100), CinI (BBa_C0076), pBAD (BBa_K206000), and LacI (BBa_C0012). 1. We transformed the BBa_B0015, BBa_C0061, and BBa_B0030 plasmids into E.coli. 2. We extracted the plasmids and tested them by electrophoresis. 1. We transformed the BBa_K084012, BBa_I761014, BBa_K081005, BBa_J23100, BBa_K206000, BBa_R0080, BBa_C0076, BBa_C1002, and BBa_I13458 which are tested by cleavage and electrophoresis. 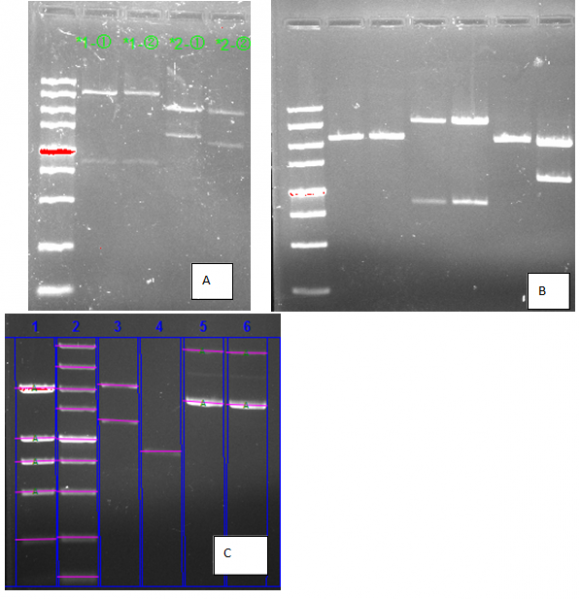 The electrophoresis results are shown in Figure 1. Figure 1. The plasmids that has been cleaved by enzyme. 1. We cleaved the BBa_K084012, BBa_C0012, BBa_I13458 with EcoR I and Spe I, BBa_I761014, and BBa_K206000 with Xba I and Pst I. 2. We amplified the BBa_K084012 and BBa_K081005 by transforming them into E.coli. And then we extracted the plasmids and tested them by electrophoresis. 3. We linked the BBa_K084012 and BBa_B0015; BBa_I13458 and BBa_K206000; BBa_K081005 and BBa_C1002 with pSB1A3. The electrophoresis results are shown in Figure 2. Figure 2. The plasmids that have been cleaved by EcoR I and Spe I or Xba I and Pst I. 1. We re-cleaved the BBa_K081005 for linkage (BBa_K081005 and BBa_C0012 with pSB1A3). 2. We transformed the linkage products into E.coli. Then we extracted the plasmids to test their qualities. 3. We transformed, extracted, and tested (BBa_K081005 and BBa_C0012 with pSB1A3). 4. We sent some of our linkage products to sequence them. 6. We cleaved the BBa_B0015 (E,X), BBa_K084012 PLUS BBa_B0015 (E, S), BBa_K084012 (E, S), BBa_K081005 (S,P), and BBa_C1002 (X,P) and we did the gel purification. 7. We amplified the BBa_I761014 by PCR. 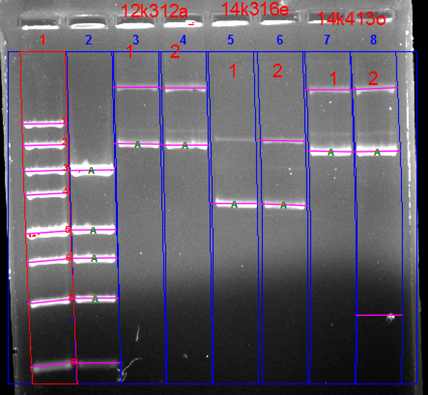 The electrophoresis results are shown in Figure 3. Figure 3. A and C show the plasmids that have been cleaved. B shows the PCR products. 1. We linked the BBa_K081005 and BBa_C1002; BBa_I13458 PLUS BBa_K206000 and PCR products (Traditional Assembly); BBa_K084012 and BBa_B0015; BBa_K081005 and BBa_C1002 (3A Assembly) and transformed them. 2. We extracted the plasmids and did the linkage again (3A assembly). 3. We cleaved the BBa_K084012 (E, S) (Named Cut 1), BBa_B0015 (X, P) (Cut2), BBa_I13458 PLUS BBa_K206000 (E, S) (Cut3), PCR products (X, P) (Cut4), BBa_K81005 (E, S) (Cut5), BBa_C1002 (X, P) (Cut6). We linked the Cut1 and Cut2 (Named Lia1); Cut3 and Cut4 (Lia 2 and 3); Cut5 and Cut6 (Lia 4). 1. We cleaved the BBa_K081005 (E, S) and BBa_C1002 (X, P) plasmids. 2. We tested the lia 6-1-1 (X, P), lia 7-1-1 (X, P), lia 7-1-2 (X, P), lia 8-2-1 (E, S), and lia 8-2-2 (E, S) by cleavage and electrophoresis. 3. We did the gel purification for all the cleavage products. 4. We cleaved the BBa_K081005 (E, S), lia 6-1-4 (X, P), lia 6-1-1 (X, P), lia 6-1-2 (X, P), lia 6 -1-5 (X, P), lia 4-2-2 (E, S) and control group (E, S). Also, we prepared the linear backbones (pSB1T3 and pSB1C3) by cleavage. 5. We linked the CUT7 and CUT8 with pSB1T3 (Named NR 1), CUT3 and CUT4 with pSB1C3, pSB1T3, and pSB1K3, BBa_K081005 and CUT6 with pSB1T3 (NR 2). 6. 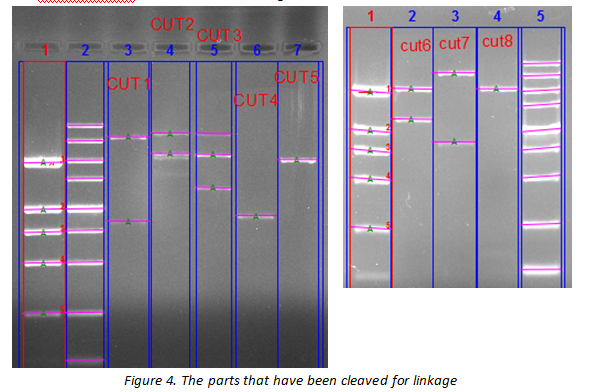 We transformed the linkage products and extracted the BBa_I761014 and BBa_K084012 plasmids. 7. We cleaved the BBa_I761014 and BBa_C1002 with Xba I and Pst I. And we tested them by electrophoresis. 8. We amplified BBa_I761014 by PCR. Figure 5. A. gel purification result; B and C. the plasmids that have been cleaved by enzyme. D. PCR results. 1. We tested the quality of our PCR products by electrophoresis. 2. We extracted the NR1-1, NR1-2, NR1-3, NR1-4, NR1-5, NR1-6, NR2-1, NR2-2, NR2-3, NR2-4, NR2-5, and NR2-6. 3. We tested BBa_B0015 (X, P), BBa_I13458 PLUS BBa_K206000 (E, S), BBa_C0012 (S, P), BBa_K084012 (X, P), NR1-1 (X, P), NR1-2 (X, P), NR2-1 (E, S), NR2-2 (E, S) by cleavage. 4. We cleaved NR2-3, NR2-5, NR2-6 with EcoR I and Spe I. 5. We linked the BBa_I13458 PLUS BBa_K20600 and our PCR products with pSB1K3 and pSB1C3. 6. We transformed the linkage products. 7. We tested the NR1-3, NR1-4 (E, S) and NR2-1/NR2-6 (X, P). 9. We extracted NR3 and BBa_I761014 and tested them by electrophoresis and cleavage. 10. We linked BBa_I13458 PLUS BBa_K206000 and NP2 with pSB1T3 and pSB1C3. 11. We linked BBa_I13458 PLUS BBa_K206000 and BBa_I761014 with pSB1T3, BBa_0030 and BBa_C0076 with pSB1A3 and pSB1T3. 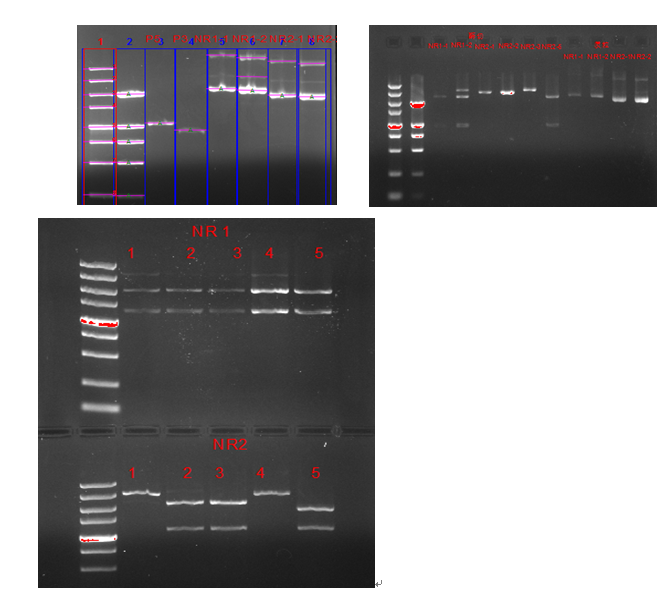 The electrophoresis results are shown in Figure 6. Figure 6. A. the results of cleaved plasmids and PCR products. B. and C. the results of linkage products.